WARNING: SO MANY photos! MASSIVELY LONG post! 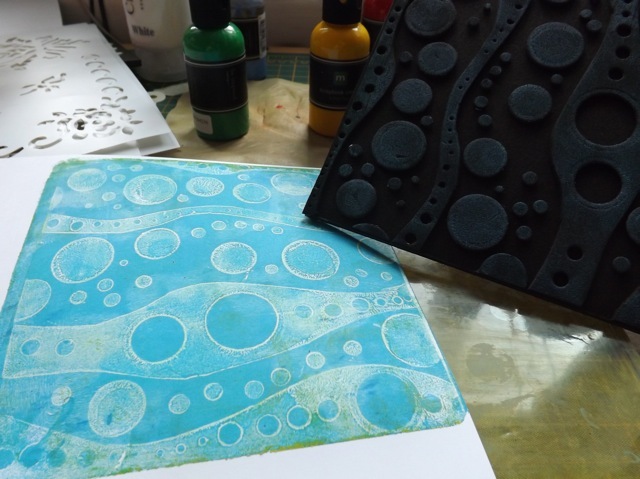 As you may have seen I had a play the other day with making some stamps/texture plates for my Gelli plate using sticky backed fun foam. I thought I would share some of the results of my play with them and a few things I learned. The grid comes out so crisp I just love it. 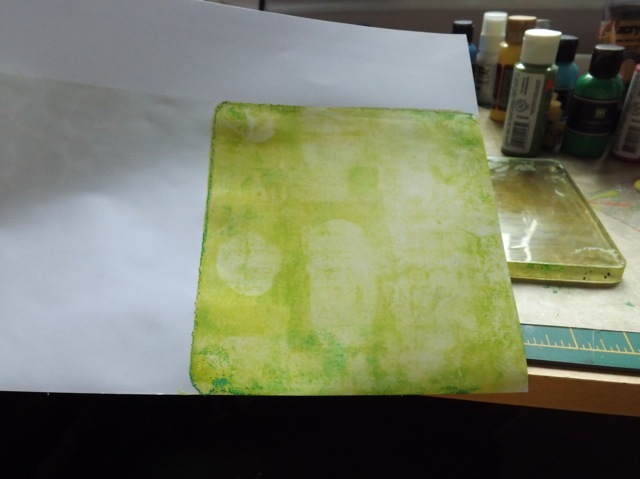 For the next one, I used a ghost print effect – ie I applied the paint, pulled the print, then applied white paint over the more or less dried paint on the plate then pulled that. I love that technique. I think I saw it done first by Carolyn Dube. This is a great video! 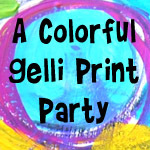 ALL her videos on Gelli printing are fab. 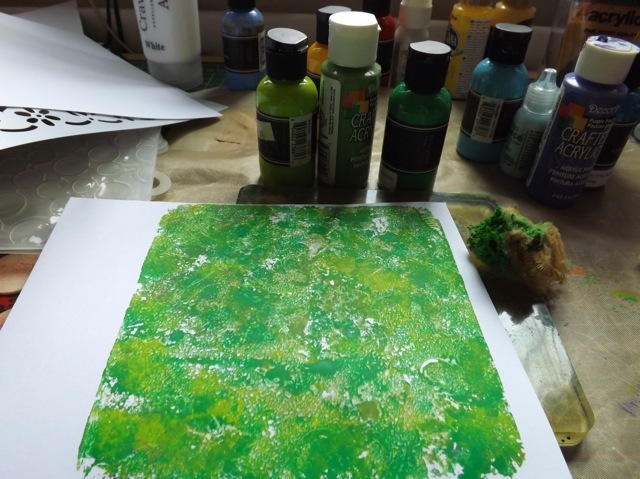 For this one, instead of brayering on the paint, I sponged it on with a sea sponge. That idea was one I had, but I subsequently found it done before in a VERY LONG (but most excellent) video by ASpriteMetamorphosis. This is a great starter video. At almost 2 hours you will need to make time to watch it. 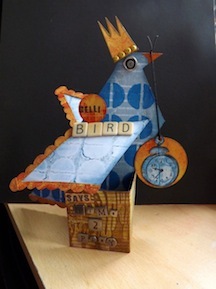 Layered up with one of my stamps, and a commercial stencil. Again, loving the ghost print! This one is lots of layers, using that white-paint-over-dirty-plate technique. 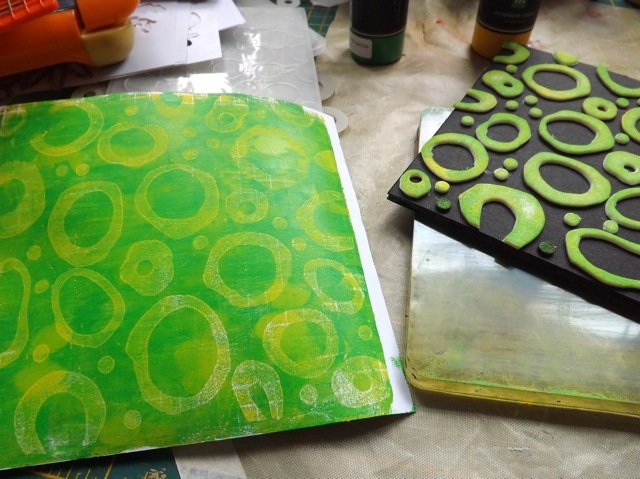 I actually pressed the 10SS grid onto one of my foam stamps (you can see the one just under the green print above!) 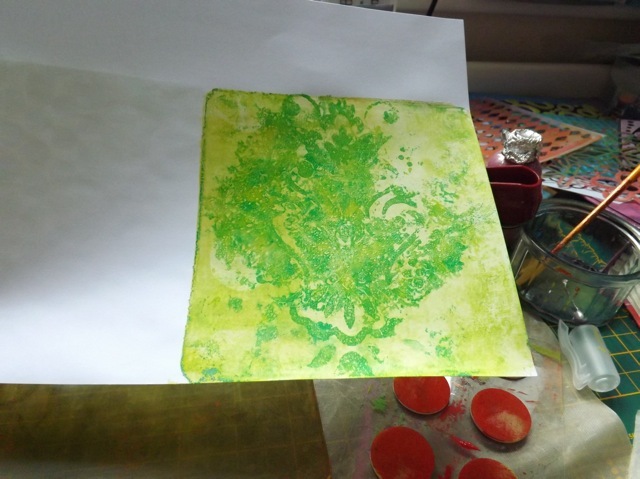 and stamped it – loved how that transferred. I would def. 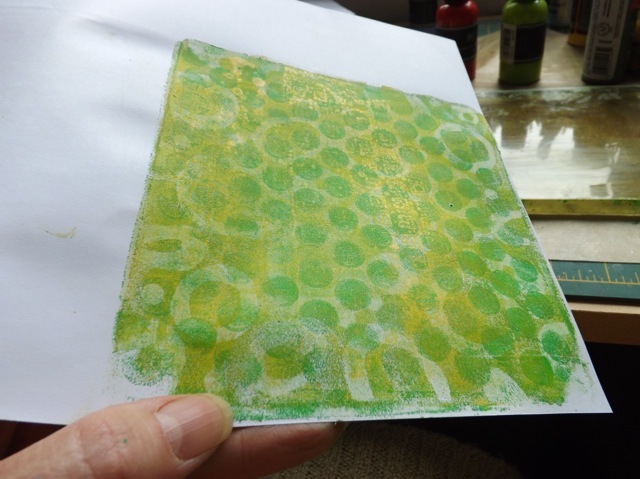 take that to other stamping, not just Gelli printing. I cut a stencil on my Cricut. 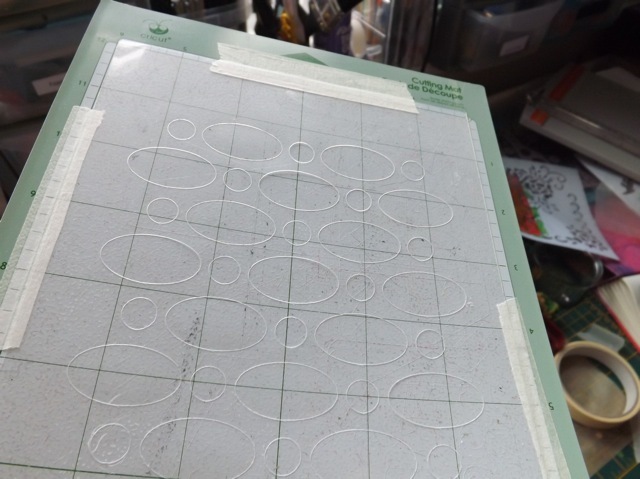 I had a bit of a hunt, and I found people doing this using paper, then adding Mod Podge to the paper, or using vinyl, but I guess I thought vinyl might be expensive, and of course I don’t have any. I’ve also seen videos for cutting similar sort of mediums (I think they were plastic dividers of some kind) with a craft knife or one of those hot pen cutters but frankly that is just too much work. What I DID have was those report covers I used for my Stamp reorg. And it worked a treat. Yes the stencil is thin (hence the ability to cut it with the Cricut) but it works after you get a few layers of paint on it, it stiffens up. 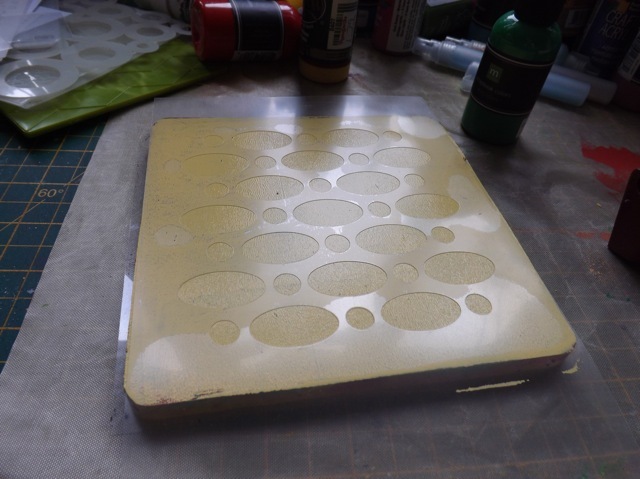 I only have the Baby Bug (only 6″ wide mat) and the 6″ Gelli plate and that was a HUGE mistake. I should have gotten the 8×11 one right off the bat. DOH! So my stencil fits within a 6 x 6 inch block. The first one I tried to cut, the folder material scooted as the blade shot over to the right. A small bit of masking tape solves that and on MY Cricut did NOT affect the movement of the mat as it was cutting. YMMV. 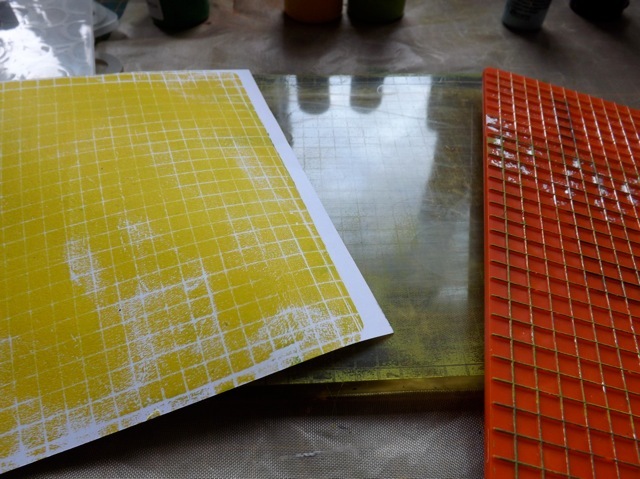 Just the normal process, apply paint, lay on stencil, pull, remove stencil pull. Yeah, Carolyn rarely cleans her plate (and I’m with her on that) and I like it because of the layered transfer prints you get. 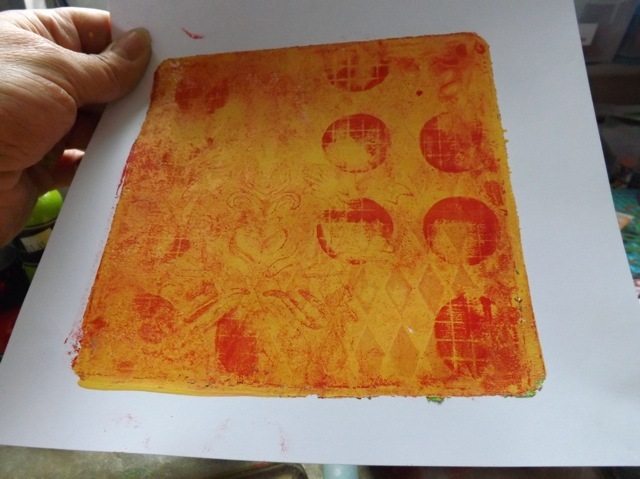 That bit of red is a holdover from a print yesterday and I think it adds an interesting element. Interesting, too, that the two people I’ve linked to could not be more different. Carolyn rarely cleans, Christy has very good instruction for keeping your plate pristine. 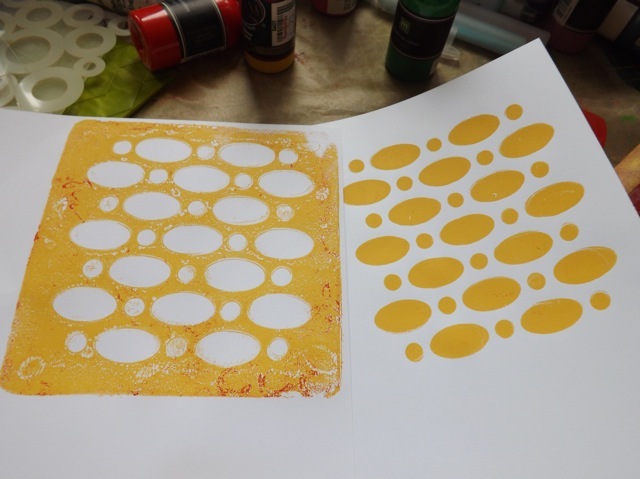 They both do fabulous prints from virtually opposite ends of the cleanliness spectrum. 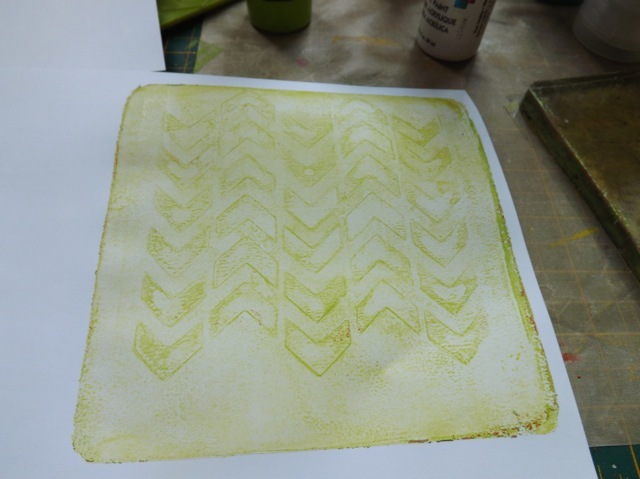 I printed another using a chevron pattern, in green over the ghost-on-the-plate from the ovals, then did the white-paint-transfer thing and got this! Lurve it. I am curious — is there any benefit to me putting the .svg files for the stencils I designed up on some download service? 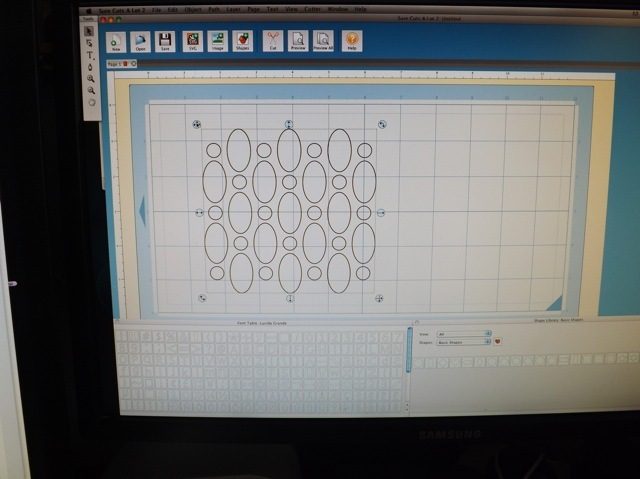 They can obviously be scaled up to fit a bigger machine, and I was able to “break apart” the elements in SCAL for editing, but they are not so outstandingly innovative (certainly not the chevron – seen 100 versions of that) or even difficult that you couldn’t make your own and then cut them using the basic shapes in SCAL. I HAVE tried creating the patterns in Photoshop but when I do I can never open the SAVE AS > .svg files in SCAL. And with the Intaglio creations I HAVE to use the SHAPES (although I seem to recal I can use text as long as I CONVERT TO SHAPE before saving as the .svg. Anyway, the point is I say it’s easy to do it yourself, but in reality it may not be. And I have NO IDEA if the .svg files will open in any other cutting machine software or in MTC or indeed in any other version of SCAL! Comment and LMK what you think. I have lots of ideas for other ones I want to try. Gosh this is totally addictive. 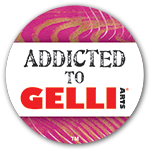 Curse you Gelli, you are the arty equivalent of crack!